My mother-in-law’s favorite color is yellow, and yesterday was her birthday. She was traveling, so I wanted to at least have a card for her when we greeted her at the airport. And I also wanted to play along with the birthday challenge at the SUO Challenges blog. Two birds, one pretty stone. I used to be all about the Brights color collection. That was my go-to set for cards, scrapbooks, everything. But Cherry Cobbler has always beckoned me to come to the Dark Side and favor the Regals. And now that Island Indigo and Crushed Curry are in the Regals collection, it’s becoming my favorite collection. I am LOVING Crushed Curry, though I usually like it in small doses (haha, can you tell by this mostly-Crushed-Curry card?). There’s that wonderful Chevron ribbon that I love so much. Yummy. The sentiment is from the hostess stamp set Express Yourself. This is a nice set to have on hand when you need a pretty sentiment — all of the sentiments are in the same font. I love the way the Large Rhinestone Basic Jewel fits exactly in the center of the flower from the Mixed Bunch set and how the embossed mat has a similar pattern to the patterned paper. The #1 thing that got me hooked on Stampin’ Up! products was the coordination of all the products together. 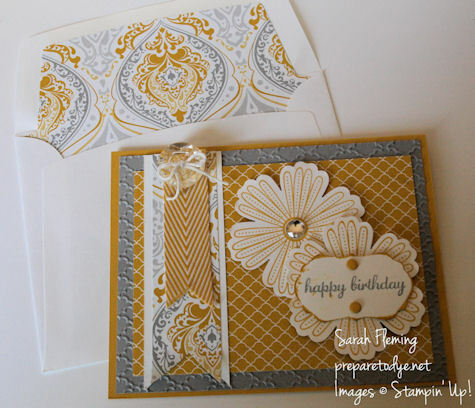 The color matching is wonderful, I love the way the punches and framelits coordinate with stamps, and I love how various designs pop up in different things. I’ll be looking at some designer series paper and suddenly notice that the pattern I’m staring at exactly matches a stamp that I own. 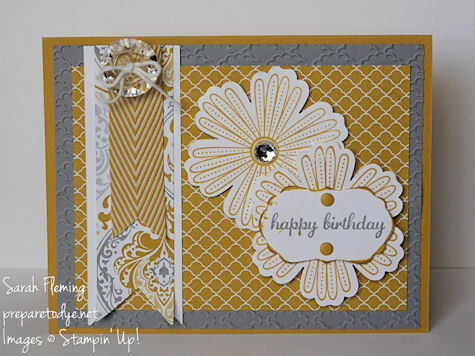 I love this feature of Stampin’ Up!. The new Envelope Liners framelits from the holiday catalog make it so easy to line your envelope! I’ve never bothered with it before because it looked time-consuming, but it’s so quick with these framelits that I’m bothering now. And the lined envelope just adds a big zing factor to the card. You can buy any of these products (and more!) at my Stampin’ Up! online store 24/7.